Jersey survived a late Guernsey fightback to end a run of three successive Muratti defeats with a 3-2 victory at Footes Lane. Jack Boyle, who has been linked with a move to Guernsey FC, gave the visitors a fifth-minute lead before Luke Watson headed in to double the advantage. Stuart Andre poked home the third for Jersey just before the hour mark. 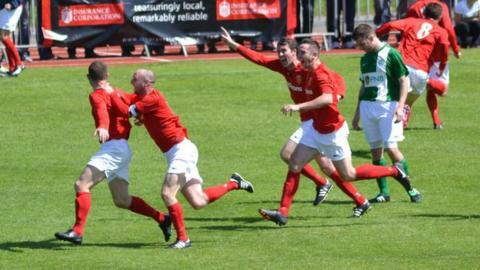 Ross Allen pulled one back for Guernsey before Angus MacKay's 87th-minute effort set up a tense finish. The defeat was the first for Guernsey's island side since Guernsey FC began playing in the English football league system. But it was a first Muratti win for Jersey boss Jimmy Reilly since taking over the island role at the start of the season. Jersey have now won the Muratti 52 times while Guernsey have won the title on 45 occasions. "After being beaten convincingly last year the boys wanted to come here today and show they can play. I thought they were absolutely fantastic. "Guernsey have the continuity of playing forty games a season but when you look at the players who played today there wasn't any difference, we were the better team." "Lifting the trophy was a great moment - not many people in Jersey or Guernsey thought it could happen. It's an outstanding achievement. "After three years of hurt we could have shirked the challenge today but there's a lot of pride in our dressing room and they wouldn't allow it." "I'm feeling a gut wrenching sense of disappointment. I'm the coach and I take ultimate responsibility for making 60,000 islanders unhappy. "We played with attacking flair and had lots and lots of chances but Jersey showed they wanted it that little bit more."